Every year before the TVB Anniversary Awards, Hong Kong’s Oriental Daily would conduct an online poll to determine which TVB artiste is the most popular choice for TV King and Queen among netizens’ eyes. The Facebook poll, which opened on Friday, is asking netizens to vote for their favorite TV King and Queen this year. Votes can be casted by liking the artiste’s profile post in the Facebook page. A Fist Within Four Walls’ <城寨英雄> Ruco Chan (陳展鵬) and Nancy Wu (胡定欣) were leading by a large margin during the first day of the polls. Ruco received 563 likes on his profile on Friday, defeating Dead Wrong’s <致命復活> Roger Kwok (郭晉安), who received 115 likes. Third place was House of Spirits’ <一屋老友記> Bobby Au-yeung (歐陽震華) with 104 likes, followed by Two Steps from Heaven’s <幕後玩家> Bosco Wong (黃宗澤) with 101 likes. Meanwhile, Nancy Wu received 2,079 likes on her profile, with Over Run Over’s <EU超市任務> Tracy Chu (朱千雪) in second place, at 90 likes. Third place is Two Steps from Heaven’s Priscilla Wong (黃翠如), with 86 likes. Inspector Gourmet’s <為食神探> Kenneth Ma (馬國明) and Speed of Life’s <鐵馬戰車> Sisley Choi (蔡思貝) came last in their respective categories, receiving less than 40 votes. Other TV King nominees include Wayne Lai (黎耀祥) from Short End of the Stick <公公出宮>, Vincent Wong (王浩信) from Over Run Over, Benjamin Yuen (袁偉豪) from A Fist Within Four Walls, Edwin Siu (蕭正楠) from Brother’s Keeper II <巨輪II>, and Louis Cheung (張繼聰) from Two Steps from Heaven. TV Queen nominees include Natalie Tong (唐詩詠) from Speed of Life, Grace Chan (陳凱琳) from Blue Veins <殭>, Eliza Sam (岑麗香) from My Dangerous Mafia Retirement Plan <火線下的江湖大佬>, Kristal Tin (田蕊妮) from Brother’s Keeper II, Ali Lee (李佳芯) from Law dis-Order <律政強人>, and Joey Meng (萬綺雯) from Dead Wrong. The TVB Anniversary Awards will be held on Sunday, December 18, 2016. I’m ok with Nancy winning (since there’s no one else )but ruco ? Not yet . Not with his role he is nominated in . Roger is more deserving for the tv King . I’m pretty sure ruco will win the most popular due to his popularity but popularity must not be mixed with best acting . @ivan Nancy winning TV Queen again? is she so fantastic? I find Grace Wong better. Grace Chan can’t make it at all. She can’t even be a host. Kenneth Ma looks more like a clown to me. Sisley improved slightly. Moon Lau should make it as Best Newcomer. @ivan I also think that Ruco and Nancy’s winning roles this yr were only ok. Not that impressive. Their acting was good given what they had to work with. Still I much preferred Over Run Over and the cast in it. But it’s a drama that required a lot of patience to watch. In comparison, AFWFW was like ratings crack, every episode was digested quick and easily. It’s the no brainer winner. @coralie rucos roles is pretty shallow and it is easier to act . I’m guessing jazz boon used the same technique in line walker in afwfw . @ivan yeah his role is just not as impressive this yr in contrast to his characterization last yr as the prince. what a shame. he did really well in that. it seems somewhat unfair because if there hadn’t been any seniors and acting veterans every yr, ruco would win. they are putting him up as a contestant against titans of the industry. it can’t be helped that he would come up short. @ivan dun be so naive since you are not a hong kong citizen. majority of the citizen are grown up watching bobby’s drama. And that ghost drama of bobby really made people to realize the importance of family. Bobby au will nail it for most popular. Ruco will got nothing this year but i believe tvb will give him consolation 0.5 award to him with nancy partner award. @lam86 nah I’m no ruco fan and I prefer bobby and roger over ruco any time . I agree with u that they will get the partnership award due to their rumors about being tgt. I’ll be very happy if Ruco or Bobby can win the best actor and for Nancy I think she’s ok too but why nobody are voting for such as Alice Chan, Jade Leung or even Joyce Tang they’re a very good actress too. I don’t even know why Grace Chan named is on the list and not Mandy Wong everyone knows Grace Chan can’t act at all. I’ll be happy looking forward to see either Ruco or Bobby winning the best actor so good luck to them. @cutie777 oh gosh, this is just facebook poll wtf, Tv king will surely be roger no doubt his acting superb like a man that got prisoned for 10 years and lost everything . Totally superb than kevin’s cheng acting 2008 drama got prison 10 years. lol. Ruco will win as the winner is made up of HK citizens voting not just TVB judges. Probably Roger Kwok is more deserving as his role is multi layered, but I can’t see him getting a 4th win…not enough buzz for him.. I love Ruco, hoping and wished that he win TV King….. But that was before Roger’s series came! Roger is great in acting! He is more deserving of TV King. I am not surprise with votes because both Nancy and Ruco is very popular and massive fans base. I Love them too , however i do prefer Roger and Maggie to win. Why isn’t Mandy Wong on the the list? She gave an outstanding performance in Law Dis-order. I found Grace Chan so annoyed in BKII. Can’t even act at all. Could it be for her relationship with Kevin Cheng so she made it on the list? What a downfall of TVB! Ruco will win popularity vote. But the elusive TV King will be Roger’s who is the deserving winner. Actress wise Nancy will win popularity vote. But she doesn’t deserve TV Queen. Grace perhaps for supporting if there’s one. Priscilla Wong improved so much I think her name should be in TV Queen list because her performance is chilling. But actress wise all are same same so I can’t decide on who since no outstanding one. Moon for most improved if there’s one. Vincent for supporting. Best series will probably be that Fist but I am hoping HK will have good taste to choose House of Spirits who to me is the year’s best series. I am also hoping TVB will add an Ensemble cast award and i will give it to House of Spirits. Bosco has to be somewhere in the list. I lament the fact that TVB should let Ruco be Roger aka have Roger’s body of work. I feel Ruco can be Vincent in Dead Wrong. A pity. @funnlim don’t think ruco can pull off Vincent in dead wrong as convincing as roger . @ivan He can try and he may be a more desperate Vincent. And he did look as thin in ruse of engagement. @ivan lol, that funnlim is always ignorant. She thought ruco’s acting is so superb and can challenge roger. 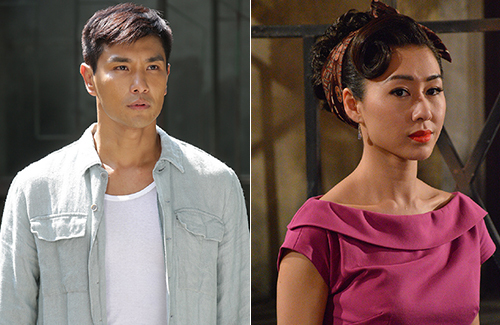 Yes…Ruco Chan can play Vincent in Dead Wrong, while Mandy Wong can play Tiu Lan in A Fist. If that so, i’ll definitely rooting for Ruco & Mandy for TV King & Queen. But unfortunately it’s not. So the TV King now is a fight between Roger, Ruco & Bobby…but Roger to me is the deserving winner this year. As for TV Queen, why not Maggie or even Alice Chan? Nancy is good & popular, but isn’t it seems too easy if she to win the title for 2 consecutive years? Maggie & Alice are not bad if the audience are not choosing based on popularity. @diana80 I think the show can delete out Tiu Lan and it would have been a better series. Tiu Lan added nothing to A Fist. She was not Fa Man. Hopefully Roger or Bobby will be TV King and Maggie will win her first TV Queen. Nancy is good actress….but I am so bored of her cos this year 80% she is in almost all drama showing. TVB no more actress left??? I miss the times where there are many fadans to compete for the best award. I never understand why TVB do not want groom Tracy Chu, though her acting is still bit raw but she have so much pontential with her looks and actings. Yes…agree on Nancy dominating the small screen this year, although I cannot deny that she is indeed a good actress. For Tracy Chu’s case, i think the reason why TVB don’t really put so much efforts on her is because Tracy seems to prioritize on her study and will not really be into acting in long-term. The competition for TV Queen will definitely be more exciting with more fadans competing for the award. I hope TVB will give more good opportunities to Ali Lee, Mandy Wong, Grace Wong, Priscilla Wong and even Tracy Chu to path their ways to become the next generation of fadans. Meanwhile, while waiting for the rising of new fadans, i hope HK audience will cast their votes for veteran like Maggie Shiu who also acted very well in the series she is nominated for; The Executioner. @falla Because too much opportunity nowdays especially mainland and oversea. Thats why once they popular they dont stay tvb. Example charmaine adi rich and popular why still need so hardworking go for drama? Its the environment that cause it. TVB awards has been 50 audience vote and 50 TVB. Ruco and Nancy already got the audience portion and TVB judges is on Ruco and Nacy’s side as well as they tend to side with the audience besides 2013 where Dayo wins. Anthony wong got it last year because he could of made a deal with TVB to film the drama. However, we don’t see the case this year because Ruco has gotten both the popularity and the acting assurance from HK. TVB awards used to be on popularity before 2006. However, I think TV is always about the popularity of a character and how well-liked the actors are. This is not HK oscars where professional judging is involved. TV actors grow with the audience and its about the artist’s efforts. Im not a fan of Ruco or Nancy beause I haven’t watched the drama, but seem like people are hiding in Roger’s shoes. Roger could win 4th time if its professional critics and other factors taking out. However, TV awards is more then acting alone. Hard to explain, but I still want to watch the awards to see the deserving actors getting their recognition for their hard work. Hope new fa dans rise, but also hoping Tavia will come back soon to film one more drama and get award like CHamrinae who left and came back in 2014 for line walker. Even linda should get a chance. OTHer actors that deserves the award is Louisa so, sonja kwok, kenix kwok, joyce tang (close this year but fell short). @lam86 theres no partnership award for Ruco and Nancy. I don’t need to hide because I do not idolize either of them, whether they win or loose. I’m only predicting the results and seems like your so sure he won’t win BA? Yes 5 more days to go and we will see..
A fan of all Ruco, Bobby, and Roger but Ruco’s role in AFWFW was not all that outstanding compared to the complexity of Roger’s character in DW or Bobby’s charisma in HOS. He just played a somewhat of a happy-go-lucky guy. Really hope the award won’t be given due the pressure of Ruco’s popularity. Also hope Grace Wong wins something too. For those who wonder why Fist is so well received by audience, here’s why: Fist moves people and people respond to it so strongly because LOVE is the underlying message of the drama. It’s not just because of the well-paced plot, the Kung fu style, the action, the comedy, and the variety of characters within the walled city that makes it damn appealing! It’s the lack of love for anything or anyone that created the monster the Pudding Guy, who deserved his death. From start to finish, you can see the driving force of love, be it misplaced or ill-intent sometimes, played out between the characters; Fist Guy’s mom embracing his dad to the very last tortured breath, the love of the daughter for her father, the gambling addict, that caused her death, the love of the androgynous brother for his younger brother, the love of the elderly aunt for her extended family members, (her letter written to Fist at the end moved me to tears), the familial love of Fa Man and Fist Guy, the brain injured young guy’s love to help the needy….I can go on and on. That’s why a lot of people love Fist, friends. It struck a very basic chord, more so than any other TVB drama of 2016 or possibly other years. And yes we the audience DO recognize the hard work of this drama and we appreciate it. RUCO deserves best actor award this year, yes, for his portrayal of FIst Guy and NO it is NOT a shallow character or so easy to portray that any Tom or Harry can make it convincing. @jsnow333 No Ruco doesn’t deserve it. His character is wasted half the time and the other half is of no significance to the plot. His performance is his usual good but Ruco is saddled with a rubbish character. Yes the driving force to anything TVB these days is love or revenge. In fist, it is love. Unfortunately the plot and the pacing is all wasted because it focused on the wrong love. Should be fa man and her brother and not Tiu Lan and Ruco. As for Pudding guy, he is one of the highlights of this series bUT it made no sense why he has conquered all of HK and now he wants the walled city. His role should have been expanded but instead the story shifted to Tiu Lan who frankly serves ZERO purpose in this series. And with that there goes ruco as well who is there to babysit tiu lan. So for me the moving character is Fa Man and of course Thai po, son and girlfriend story which is consistent and made more sense. There is no basic chord. If audience sit down and ponder a little, they will see fist as a poorly written story and how OTT Nancy was. When Nancy was interesting, with the murder and all, it could have been great and then so called amnesia and back to square one to Tiu Lan doing nothing. Sorry, Fist is not the best series nor is Ruco the best actor. Best series is a simpler but much deeper and strikes more chord that is House of Spirit. Best actor as in TV King has to be Roger to manages to make Vincent somewhat likable. That is why I said Ruco should have Roger’s career. At least Roger doesn’t need to babysit lead female characters. Ruco may be better served for winning for Captain of Destiny which again focused on the wrong things and is frustrating to watch. I hope TVB will remake Hanzawa Naoki, I will want Ruco in that role and that WILL make his win deserving. @funnlim I agree with u. Ruco is a good actor but his roles don’t normally allow room to show his acting chops . Roger is a veteran and can act very well . He also have luck in his roles that’s why he can show off his acting chops more easily and impactful . House of spirits is one of the best series this year but I’m afraid tvb won’t give it best drama because it’s a remake . Afwfw will most probably get best drama due to its ratings hit. @jsnow333 Agreed with you. Ruco deserves best actor award this year, and for the best actress, it should go to Maggie. Can’t agree more. AFWFW deserves credit. It’s unfair the judge the acting based on the character itself. Heavy taste roles are more eye catching but plain characters can reveal the true acting skill of an actor. So I compare Ruco’s Fist guy to that of Roger in ‘Healer in the forbidden city’, both are ‘shallow’ characters. Ruco can make it lovable(his popularity shows) whereas Roger made the boring character even more boring. he didn’t deserve it, but the after award feedback from the netizens showed that his performance was the best of the year. Coincidence? Roger’s role was tailor-made but his acting is more or less repeating BHWS and can’t surpass it. I even found him a bit OTT. Ruco who picked up the role second hand from Him Law has a true breakthrough. At the age of 39 he played a 26 yr old kung fu young guy and not offensive at all, not easy job. Comments were seen that if the original Him was Fist guy, AFWFW couldn’t be so hot. Ruco can portray Vincent in DW but Roger definitely can’t act Fist guy, just fails in cast. Sacrifice… Roger lost 28 pounds, Ruco also lost weight due to kung fu and physical training, heavy action scenes, on-diet and filming BK2 simultaneously, and also attending promo events for COD. My conclusion, Ruco deserves his belated tv king this year. @66ksc dude…. of course roger cannot act as kuen lo in afwfw . He’s too old ! @66ksc fair comment where give credit where it’s due. I don’t see how Roger is anymore deserving than Ruco for the fact that his acting in DW is nothing special. By nothing special means his portrayal of his character didn’t surprised me, and it is as predictable as his other drama. I would just say his acting solid as best. Losing weight has nothing to do with acting. I disagree with the comparison of Ruco’s Fist & Roger’s Last Healer dramas. The storyline in A Fist drama is definitely more attracting than the Last Healer. An interesting drama itself can already pull at least 50% audience to watch and like the drama. I doubt very much that the rating will be higher for Last Healer if it was Ruco who plays Roger’s role. In addition, i also disagree that Roger can’t act as Fist guy. If the audience can accept an elder Roger for the very young role in A Fist, I believe he also can portray the role well…if not better than Ruco. Instead, i’m wondering whether Ruco could act Roger’s role as Ah Wong in the old series with Jessica Hsuan, which to me is so memorable because of Roger’s great acting. Anyway, be it Ruco or Roger for TV King…it’s still within my expectation & i’ll be happy for whoever is winning. I disagree with the comparison of Ruco’s Fist & Roger’s Last Healer. The storyline in A Fist drama is definitely more attracting than the Last Healer. An interesting drama itself can already pull at least 50% audience to watch and like the drama. I doubt very much that the rating will be higher for Last Healer if it was Ruco who plays Roger’s role. @diana80 lol, At least history shows main actor doing action movie or drama did not getting any best actor award before. Or else jet li, donnie yen and jackie chan whose acting skill way above than ruco in any timeline on earth already gotten their best actor awards that so deserving. Any actors i also like in tvb except this ruco because his face really hak yan cheng ler. kakaka…thats why most of his drama u can see he portray as bad guys because his face really hak yan cheng. Example that pirates drama he suits so well fitted as pirate with his hak yan cheng face. So no way he can act as ah wong with jessica hsuan. He dont have that kind look. Whereas Roger can have so kind look and evil look! And for this year, actually that hak yan cheng ruco very high chance to get Tv King but too bad TVB dont want to give him.If without this top notch acting of roger in dead wrong, then tvb no choice must give him adi. hehehe… Ruco man man wait la, next year got many top actors top dramas, ruco dont dream can get it next year as well..
Actually I should just ignore you but cannot help telling you that yout are the hak yan chang one since you can harbour so much hatred for an innocent artiste. Even if you dont like Ruco, there us no need for you to attack him so ruthlessly. You have shown the whole world the kind of hateful person you are. @diana80 Roger got his BA which he deserved. That was then and now is a different context. Anyway I do see the Ah Wong character surfaced in DW which I find it odd. Anyway, Some here may think that he’s good if he pulls off some impressive effect, such as gaining or losing a lot of weight or pretending to be handicapped. Those are impressive stunts, but they aren’t the core of what actors do. If you forced me to rank Dustin Hoffman in “Rain Man” vs. Dustin Hoffman in “Kramer vs. Kramer,” I’d say he did more exciting work in the latter. In “Rain Man” he was able to hide behind some stunts. In “Kramer vs. Kramer,” he just had to be truthful.